Sleep is the cornerstone of good health. It doesn't matter how good your diet is, or how many times a week you're exercising, if you're not getting enough sleep you will not feel as vital, or energetic as you could. Many people get caught in front of the TV, or on social media several nights a week, and their bed time gradually creeps later and later. A viscious cycle is created when we induce a chronic lack of sleep. In order to feel awake each morning (and possibly each afternoon),we reach for caffeine and sugar. These two substances can wreak havoc on our health and create their own set of health problems. Going to bed earlier and having a restful night's sleep can mean we have less of a dependence on stimulating substances, and can keep them as an occasional indulgence. Perhaps if you have not had a good night's sleep, you sleep in and don't allow enough time for breakfast in the morning. Or perhaps you are so busy taking care of your family's needs in the morning that you neglect your own. We have all heard the mantra that breakfast is the most important meal of the day. Well, it's true! If you skip breakfast, or just have a cup of coffee, you are much more likely to eat unhealthy foods at 10 or 11 o'clock. This then becomes its own negative habit or pattern. It is important for your health to create a morning routine that enables you to eat a healthy breakfast. Be careful not to overdose on sugar by having fruit juice and sugar-laced cereals. It is easy to create a balanced breakfast by eating simple things such as egg and/or avocado on toast, porridge, or yoghurt, fruit and nuts. 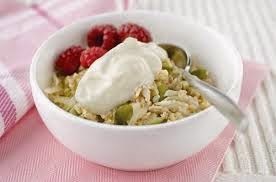 If you are interested in some more healthy breakfast ideas, I have written extensively here, here, here, here and here. (Mmmm...there is definitely a recurring theme on this blog! Perhaps it's time to move onto other topics, such as lunch?) If you really can't face eating breakfast, try a smoothie or at least a couple of pieces of fruit, so your body is fuelled before you leave the house. So there you have it, two simple basics of good health. Get these two right, and you are well on your way to enjoying good health.